What is the Linksys Smart Wi-Fi Router, EA6500? The Linksys Smart Wi-Fi Router AC 1750 HD Video Pro, EA6500 lets you access the Internet via wired and wireless connection. The Linksys Smart Wi-Fi Router, EA6500 is ideal for media-centric applications such as streaming video, gaming, and Voice over Internet Phone (VoIP). The 2.4 GHz Network caters to devices in your network that are 802.11n (N-only) and 802.11g (G-only) or a combination of both using Mixed mode. The Linksys Smart Wi-Fi Router, EA6500 wireless network settings include the Mixed mode which will allow backwards compatibility with Wireless B/G/N devices. QUICK TIP: The maximum speed that your devices can achieve with an 802.11n adapter on the 2.4 GHz band is up to 450 Mbps. The 5 GHz Network will only be able to cater to devices in your network that are Mixed, N-only, and AC-only. The Mixed mode will still allow backwards compatibility for 802.11a devices. QUICK TIP: Connecting a device with an 802.11ac wireless adapter on the 5 GHz network that is set to AC-only will enable you to achieve up to 1300 Mbps speed. However, by setting your network to AC-only, all other Wireless-N/G/B devices will not be able to connect. The Guest Access is an additional wireless network feature that allows your visitors at home to access the Internet but not your local network (i.e., shared storage devices, printer access). For your Connected Home, you may use the 2.4 GHz network to connect your wireless devices to surf the Internet and email, share files, and print. The 5 GHz network is best for heavy applications including Voice over IP (VoIP) calls, online gaming, and streaming high-definition videos. To know more about the Connected Home, click here. A new hardware feature of the Linksys Smart Wi-Fi Router, EA6500 is the built-in dual USB ports that can easily add gigabytes of storage space onto your network connecting two (2) USB 2.0 hard drives or USB flash disks. The dual USB ports of the Linksys Smart Wi-Fi Router, EA6500 also allow you to set up two (2) USB printers at most on your network. 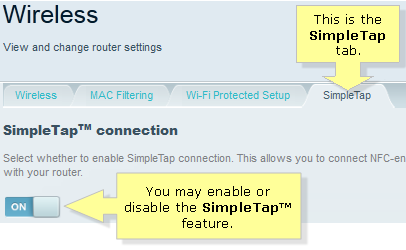 A new Linksys Smart Wi-Fi Account feature for the Linksys Smart Wi-Fi Router, EA6500 is the SimpleTap™, a faster and easier way to connect your Near Field Communication (NFC) compatible smartphone to the Linksys Smart Wi-Fi Router, EA6500’s 2.4 GHz wireless network. To learn about SimpleTap™, click here. The EA6500 is built with security features to control and protect your router and your home network. One of the security features on the Linksys Smart Wi-Fi router is its software based firewall which is IPv4 and IPv6 compatible. These Internet Protocols have their own firewall protection, which are Enabled by default. To learn more about the security tool of the Linksys Smart Wi-Fi, click here. NOTE: Visit the Linksys Smart Wi-Fi Router, EA6500 Product Page to read more troubleshooting articles, downloadable user guides or firmware updates, and other support information related to this product. IMPORTANT: In case the indicator light does not flash like any of the behavior stated above, you need to observe your connection first. If the connection works fine, the unusual activity of the indicator light only pertains to an active network connection. However, if you start experiencing intermittent to no connection, you may need to powercycle your router for one (1) to two (2) minutes. If this does not fix the problem, you might need to update the firmware and reconfigure the settings of the router. These Ethernet ports connect the router to computers and other devices on your wired network using Ethernet cables. The two (2) USB 2.0 ports connect to a printer or a USB storage device. The USB 1.1 standard supports a speed of up to 12 Mbps. The USB 2.0 standard supports speeds up to 480 Mbps. 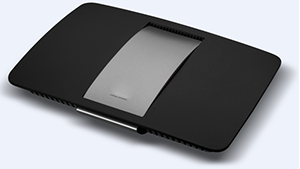 The Linksys Smart Wi-Fi Router, EA6500 recognizes USB 3.0 devices however it will force the device to run on 2.0 speeds. QUICK TIP: The Linksys Smart Wi-Fi Router, EA6500 USB port supplies up to 1000 mA power on devices. It is also FAT32, NTFS, HFS+journaled and non-journaled capable for data storing formats. This button allows you to reset the router to its factory defaults. Press and hold the Reset button for approximately 10 seconds. This button is located between the USB and Power ports. You can also restore the defaults by accessing the Administration tab > Factory Defaults sub-tab in the router’s web-based setup page. The power port connects to the power adapter that comes with your router. NOTE: The Linksys Smart Wi-Fi Router, EA6500's serial number and MAC address can be found at the bottom panel. The Linksys Smart Wi-Fi Router, EA6500’s serial number has 14 alphanumeric characters.